Opposition TDs have demanded to know how an unrecorded incident came to be known by the country’s top Garda. ALAN SHATTER has revealed that it was the Garda Commissioner, Martin Callinan, who informed him that Mick Wallace had benefited from Garda discretion in not facing penalty points for using a mobile phone when driving. The justice minister told the Dáil he had revealed the encounter to the public – on last Thursday night’s Prime Time, during a debate about the internal Garda investigation into penalty points being removed – in order “to defend the integrity of an Garda Síochána”. 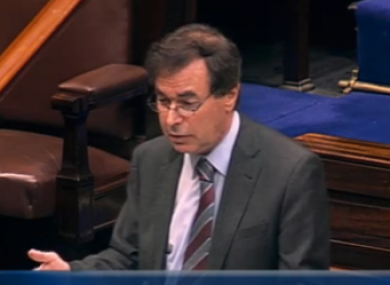 In a special Dáil debate on Shatter’s use of privileged information – instigated by the minister himself, after calls from opposition parties and some Labour TDs – Shatter said it was “absurd” to suggest that he would keep files on political opponents. He said that the Garda Commissioner had a legal requirement to inform the Minister for Justice of issues relating to public confidence in the Gardaí – and defended Callinan by saying he had “a duty” to inform Shatter about Wallace’s encounter. I have no doubt the Garda Commissioner was mindful too that Deputy Wallace might make public reference to the incident as part of the public controversy which was going on about Fixed Charge Notices and, in those circumstances, he had a duty to mention it to me. The minister said his disclosure was prompted by Wallace’s comments on the Prime Time show, where he said it was illegal for Gardaí to exercise discretion in the governance of the penalty points system – a claim Shatter described as a “gravely serious allegation” against the force. If Deputy Wallace feels that I did him some personal wrong by mentioning it, then I have no problem in saying I am sorry. He said he had no idea how the Garda Commissioner himself had become aware of Wallace’s incident, and said he also didn’t know how a journalist had gotten information about the exact location where Wallace’s incident was said to have taken place. He said the incident – at the Five Lamps in Dublin last year – had not even resulted in the exchange of any words with Gardaí. He accused Shatter of trying to misrepresent his concerns about the use of Garda discretion to remove points from licences, and accused Shatter of showing a “fundamental lack of respect” to the independent TDs who had tried to raise valid concerns about how the system was managed. He also said the internal Garda review into the penalty points system had underlined the fact that there was no paper trail to back up the reasons why a Garda was seeking to have the points removed. Wallace said he was confused as to why the internal Garda report had not disclosed the names of individuals whose points had been removed – while Shatter still thought it reasonable to release Wallace’s name. “He didn’t get a fixed charge notice terminated… he didn’t even get a fixed charge notice,” Wallace said, referring to himself. One man’s discretion is another man’s favouritism. Daly also asked how an incident which was not recorded on the Garda PULSE system had ended up becoming the knowledge of the Garda Commissioner, and later the minister. She said she believed it was unlawful for Shatter to reveal details of Wallace’s incident, and said the information was in fact ‘misinformation’ because Shatter had not recounted the details correctly. Fianna Fail’s justice spokesman Niall Collins said Shatter had made it clear in 2010, when calling for Willie O’Dea’s resignation as Minister for Defence, that the use of privileged information against a political opponent was never acceptable. Sinn Fein’s Padraig Mac Lochlainn said the comments were particularly concerning given that Shatter held the cabinet positions for both justice and defence, meaning he was privy to more sensitive information that most ministers in Irish history. Email “Commissioner told Shatter about Mick Wallace's encounter with Gardaí”. Feedback on “Commissioner told Shatter about Mick Wallace's encounter with Gardaí”.